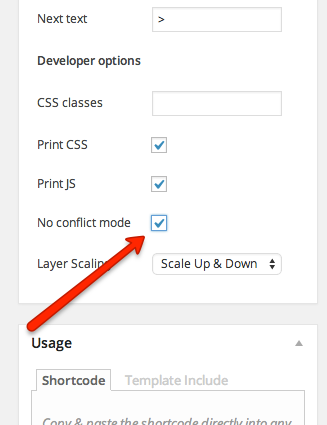 What does “No Conflict Mode” do and why is it needed? To understand No Conflict Mode, first we need to understand the problem. Note the “flexslider” class on the slideshow wrapper, this is needed to apply the flexslider styling to the slideshow. In most cases, this works. Because the MetaSlider slideshow has a “flexslider” class, this call to FlexSlider will be run on the MetaSlider slideshow, but (crucially) without the MetaSlider specific settings. Note, the “flexslider” class is absent. This means the themes call to FlexSlider will not target this slideshow. Delaying the addition of the “flexslider” class to the slideshow markup will stop a theme from “hijacking” the MetaSlider initiation code. The “flexslider” class is added immediately after in order to apply the correct styling to the slideshow. In the slideshow Advanced Settings, check the ‘No Conflict Mode’ checkbox and save the slideshow.